Comic strips are a sequence of drawings drawn particularly in boxes which tell an amusing story, and you will see them mostly in newspapers or magazines. Comic Strips are becoming a very popular medium of storytelling. Comic strips can be that smart tool that you have been looking for to market your products and they grab the attention of the viewers unlike any other. If you intend to use comic strips to showcase your marketing messages in a humorous way, you will need some cool and presentable comic strip templates that will make your job easier. Kindly go through the templates as mentioned below as they will help you in understanding this concept in an appropriate manner. This template offers a fun way to write stories with beautifully drawn cartoon characters who portray varied expressions. You can incorporate your marketing messages in the blank spaces available with the characters. They will surely help in grabbing the attention. 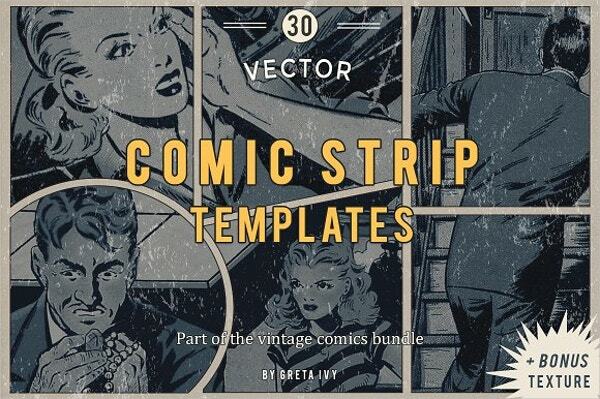 This Vector Comic Strip Template pack contains thirty unique comic strip templates that you can use effectively for your comic themed projects. All you need to do is, clip your artwork over the templates in a few clicks, and you will be ready to tell your story or your message in the form of a story. You can even change the size and shape of the objects as per your requirement. 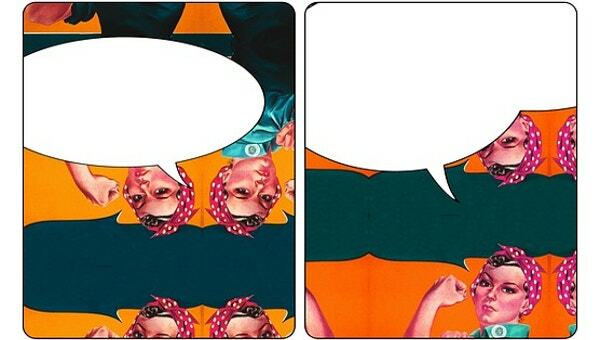 Comic Book Strip Template will be an ideal template for those who have a story or a concept or a message which they want to present in the form of a comic strip for the attention-grabbing purpose. This template offers step-by-step instruction about how you should go out this task in a hassle free manner. Download this template and use it for your purpose. You can also check the Comic Storyboard Templates. 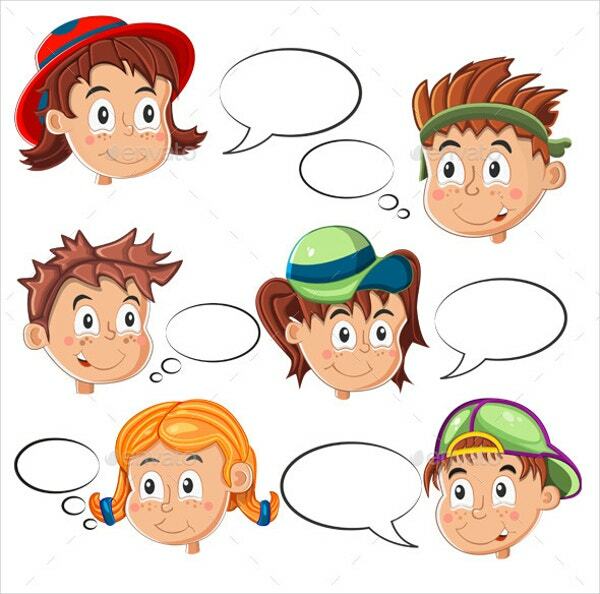 Comic Strip Template With Speech Bubbles is a comic strip template that can be utilized for demonstration purposes. This template lists the time that will be needed for the lesson, difficulty that you may face, subject followed by a list of material required for execution. You will also get a detailed description of the procedure that needs to be followed for creating a comic strip. 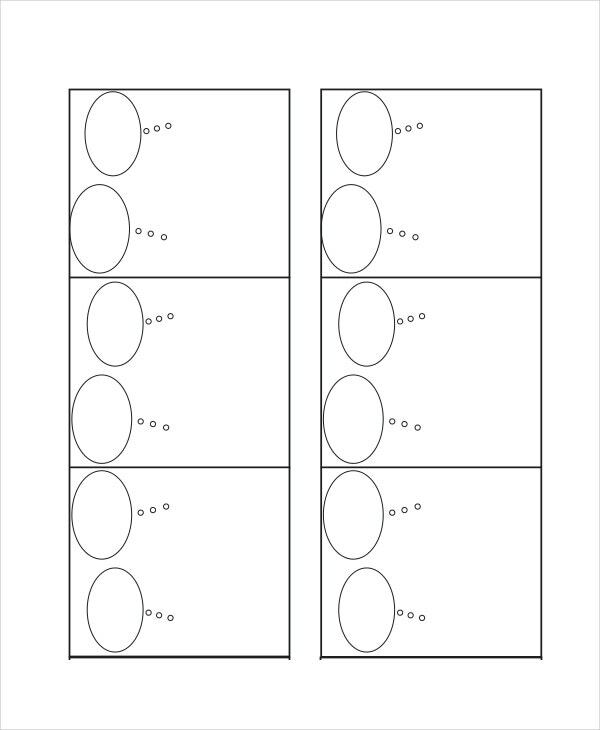 Printable Blank Comic Strip Template can be used by teachers who can instruct their students to create comic strip biographies of their favorite authors, historical figures, scientists, musicians, artists, celebrities and much more. These templates can also be used for the purpose of creating book reports, book talks. Download this template, and you can customize it to suit your needs. Who doesn’t like a story based on a superhero? 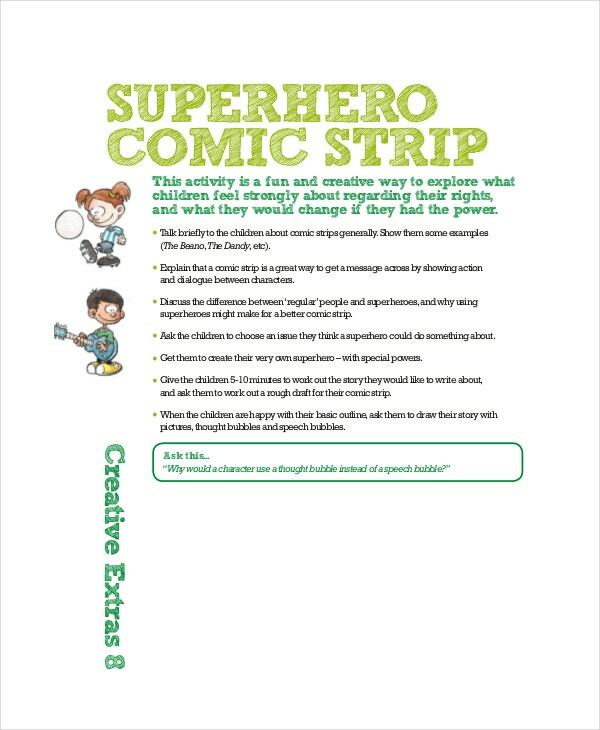 We all love them, and this Superhero Comic Strip Template can be used for bringing the imagination of the kids to the fore. This template can be used to ask the students about any ongoing issues and ask them to think and imagine as a superhero. They even can be encouraged to come up with their stories based on any superhero. You can also see the Comic Font Templates. 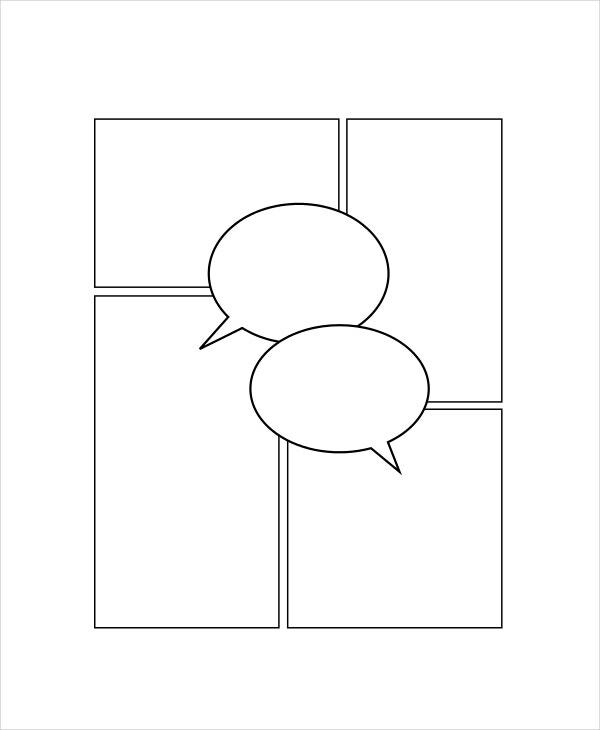 This Comic Strip Conversation Template can be used to elaborate a conversation using simple drawings, and the conversation can be between two or more people who may be reporting the past, explaining the present or planning for the future. 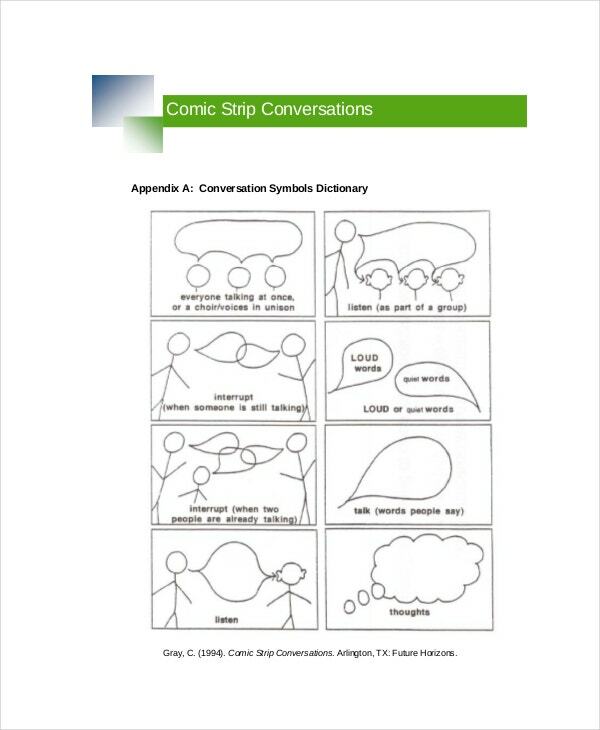 This template can serve the purpose of illustrating the ongoing communication and provide additional support to those individuals who struggle understand the quick exchange of communication that happens in social situations. 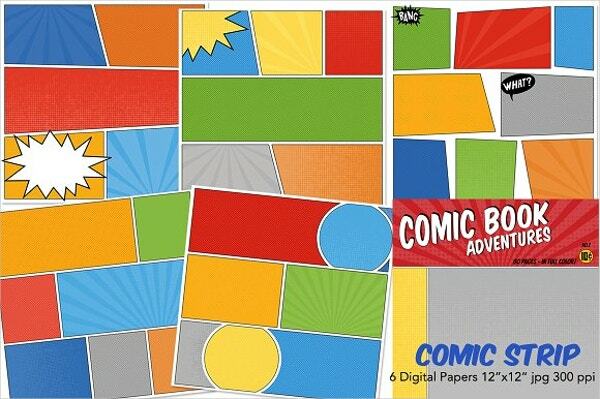 You can use this Comic Strip Digital Papers to craft your comic book or superhero story, cards, and other design projects with this fun set of digital paper templates. This is a fully customizable template, and you can change color, shape and size of this template as per your liking. Creating a comic strip for any purpose is a challenging task as one needs to combine art and imagination to create something unique. Thankfully enough these templates are there to make your job easier, and now you don’t have to create something from scratch. You can go through our collection of Comic Storyboard strip templates and choose the one that best matches your requirement.